Wacky News Names makes for a great gag gift, even though the names are all real and all verified. Wacky News Names is the cure for anybody having a down day. It's the novelty gift that just keeps you laughing. The names are all real, funny and really funny. They're thought-provoking because they've launched their owners on inescapable career paths and the rest of us into fits of laughter. Read about statistician Cathy Boring, cult expert Jack Christ and crane maker Terry Growcock. Wacky News Names is a humor book based on real, verified names that are amazing because of the person's occupation or context in a news story. See some cartoons featured in the book. 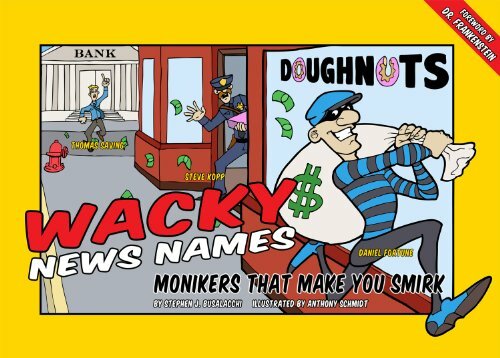 Wacky News Names by Stephen J. Busalacchi is a humor book based on real names. They're funny or ironic because of the context of the story in which they appear or because of the person's occupation.